Imagine this, you arrive at the parking lot, a screen welcomes you by your name and tells you which parking slot is available for you. You walk into the office and pick a place where you would like to work from (probably around your teammates working on a project). You walk to your desk and your task light comes on at the right color temperature that you have set and at your desirable lux level. The air conditioner comes to life around you and your system starts up with your required programs activated. The possibilities are many and exciting. The workplace starts to become smart and intuitive towards your needs. The workplace becomes an extension of you. By organizations who understand that innovation in the workplace would determine their growth. By employees who look not to be doing just a job, but to be working on meaningful and challenging topics or projects. When did this all start? Or when did we realize that we could mould the workplace to align with the work culture? Undoubtedly, it was with the advent of wireless technologies and growing use of laptops and portable devices – mobility. Suddenly one could move around and was not imprisoned to his or her work desk. 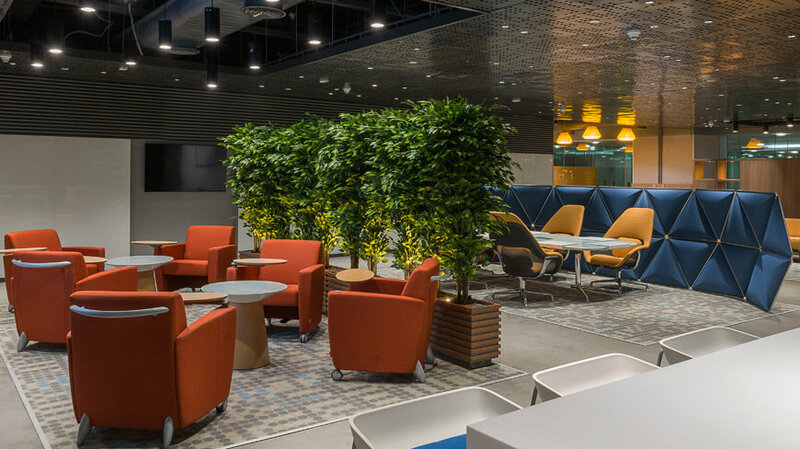 This change gave the workplace designer more flexibility and with that, the office started morphing from a sea of work desks into break-out spaces, lounges, work bars, cafeterias etc. A perfect example for this is GE Digital in which our design firm RC Architecture worked on the logic of people deciding how and where they would want to work from. The entire office offered a palette of workplaces. From work tables to ‘quite lounges’ to ‘living rooms’ where one could decide based on the type of work they were doing at that given point of time. Now what makes this even more interesting is the role and contribution of technology. Technology driven companies ranging from start-ups to tech giants like Google, are constantly working towards leveraging power of mobile devices, fitted with numerous sensors that can detect and read most of the useful data in our surrounding. The scale, vibrancy and community culture of tech industry has made sensor based devices and respective software packages, affordable and open-source. This helped a lot in making workplaces smart and alive. Sensors fitted around the office enable exchange of information from different devices at real time. These sensors could now talk to your wearable devices. The wearable device could vary from your phone, to your smart access card to smart bracelets/ rings, etc. While 8.4 Billion devices are estimated to be in use in 2017, the number of IoT devices talking to internet from workplaces in future will be huge. The other area where sensor based technologies get interesting is from the facility planning perspective. Sensors fitted below desks can give you data as to who is occupying and for what durations. Sensors in meeting rooms can give you the number of people occupying a meeting room during the day. Sensors in breakout areas / third spaces can give you the utilization of these areas throughout the day. All this information, collected and stored, can be used to optimize the workplace using Big Data Analytics. You could now determine the usage of certain size meeting rooms which could help in planning your next facility or help you in renovating. You can optimize the seat counts by analyzing the occupancy vs the attendance. It can help you optimize your energy requirements. You can now map the energy usage and compare it to historic data. You can map the physical movement of all employees and use the data to understand user patterns. The possibilities are countless and are exciting. While already, numerous powerful technologies like virtual reality, artificial intelligence, augmented reality are here, their optimized workplace integrations, right collaboration of software and hardware devices will redesign the future workplaces. While exciting times are upon us, there seems like there is a lot to come soon.